InstantAction CEO: Retailers Are "Parasites and Thieves"
Louis Castle is back with more vitriolic criticism to lay down on retailers that sell used games. Just as in the past, InstantAction CEO Louis Castle has some strong words for videogame retailers that participate in used sales, and this time they're even worse. He believes that stores such as Walmart and GameStop are destroying the industry. "They're parasites and thieves," he says of the retail chains. "Because they don't let the publisher participate in the used games business. They take all the money. They take a game from somebody for $10 and then turn around and sell it for $30, and they don't give any of that $20 back to the original copyright holder. Something would be ok, but zero is not ok."
He admits that the used games business is legal, and that there's nothing anybody can do about it, but compares selling used games to the "statistical theft" of gambling, saying "just because you can legally steal doesn't mean it's not stealing." InstantAction is a digital distribution platform, so Castle isn't personally losing money to used game sales, but Castle seems protective of the industry and thinks used games are seriously harming it. He uses an analogy to describe his point: "If we make something like woolen blankets and we start eating the sheep, pretty soon, we have no more woolen blankets. It's taking from the one thing that's making you money. If we stop making games, they stop being able to sell them." To Castle, shrinking margins in retail are not an excuse, because used games are "shrinking the publishers' margins so we're all shrinking and are going to go out of business." "Publishers are the ones who are taking all the risk," he believes. "They're paying for development, pay for the marketing - the retailer has zero risk. It's all consignment anyway: if a product doesn't sell, they box it up and send it back to the publisher. I'm sorry their margins are eroding, but that's not the publishers problem. To use a loophole in the law to just gouge them is just unacceptable." 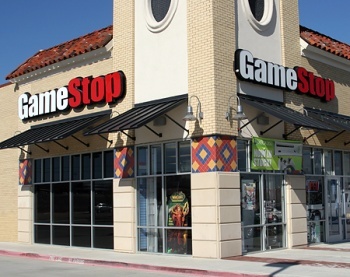 Castle thinks there are other ways to retain customer loyalty rather than selling used games in a way that cuts the developers and publishers out of the loop, such as with rewards programs or by stores becoming known as places with knowledgeable employees. But would this be enough to keep them in business? GameStop says no and that it wouldn't be here without used games. At the same time, analysts have posited that used game sales correlate with a new game sales decline. Even with all of the analysis in the world, and opinions by industry veterans such as Castle, we'll never truly know the impact of used games on developers and publishers because there are too many factors. Used sales will continue, and on a widespread scale until the industry shifts to the point where it creates a mandatory direct route from publisher to customer.